A large house with good insulation, but large glazed areas and a full complement of electric hungry teenagers (with computers, music etc). We installed a Worcester Bosch 11kw ground source heat pump system and Greenstore solar cylinder, combined with a RM Solar 2 panel on a roof Solar panel kit. The data from the 1st year’s running, which shows that the solar panels ran all the hot water for 6 months without any help from the heat pump system. The electrical installation from design up uses the latest low energy technologies to maintain low running costs. I have had some interesting discussions on oversizing the brine system. Usually consisting of “it’s more expensive, it’s not needed!”. a) The higher the incoming temperature the higher the COP (We recorded 11 degrees in November on the working heat pump on this project). b) No danger of freezing the ground. c) Less work for the heat pump system. 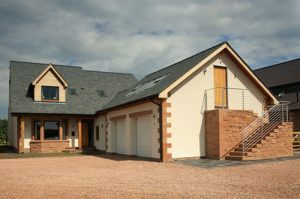 Having designed and built my house from scratch I felt it was vital to find a company with the correct expertise and engineering skills. As well as the know how to install the renewable energy systems correctly. I made the right choice as the system does exactly what it said on the tin and more! Greenfields have been a first class company to deal with from design through to completion. I feel I have made an excellent investment for the future with the help of Greenfields Heat and Power Ltd.